Cut out the small squares of the puzzle and have students arrange them into one large square by matching up the questions with their answers. Make several sets so that students can work individually or in groups. They should pay careful attention to the pronouns and the endings in the questions and answers in order to match them up correctly. When they are finished, they should write down the answers they found for each question on the accompanying Question sheet. 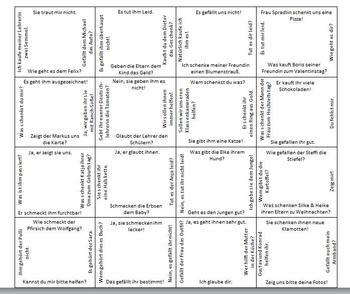 Although I based the vocabulary in this puzzle off of the Komm Mit Level 2 textbook, it may be used with any book and is editable.